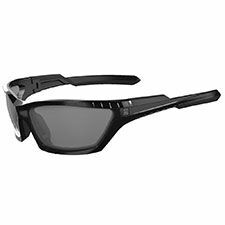 Features and Benefits Smoke lenses provide maximum glare reduction, won't distort colors, and are excellent in bright/glare conditions. Polarization dramatically reduces glare. T-Shell coating means resistance to scratching, cracking, and crazing. Selenite polycarbonate is die-cut to produce lenses without distortion from any angle and is ten times more impact resistance than glass or resin lenses. Frames are built with Grilamid TR-90, a homopolyamide nylon characterized by an extremely high alternative bending strength, low density, and high resistance to chemical and UV damage. They are virtually indestructible.